To help people avoid CVD risk and make healthful changes, perhaps RDs should emphasize foods to include, not exclude. “Don’t,” “limit,” and “avoid” are perhaps the three most common initial words of dietary advice given to people with cardiovascular disease (CVD). Nutrition professionals and others in the health community often hand out well-meaning but overwhelmingly negative dietary guidance. Rather than helping, such negative admonitions can add yet another layer of anxiety to the already unwelcome diagnosis of a chronic condition. For decades, nutrition counseling for patients with CVD focused mainly on foods and nutrients to avoid, such as sugar, trans fat, saturated fat, butter, beef, and fried foods. But that approach has proven largely unsuccessful, considering heart disease remains the No. 1 killer of both men and women. According to the Centers for Disease Control and Prevention, two thirds of Americans are now either overweight or obese, and an estimated 10% of the population has diabetes, both major risk factors for CVD. But now there’s a dietary sea change under way. Experts are exploring a different approach for treating CVD and reducing the risk of recurrence. They’re focusing on the foods that patients and clients should eat more of, not less. While a negative approach has historically worked well for other risk factors, such as smoking (“don’t smoke”), nutrition is different. Smoking can be an all-or-nothing proposition, but everyone must eat. How much, when, and where depend on emotions, values, beliefs, and culture, not just need. Speaking at the symposium “Achieve Better Health With Nutrient-Rich Foods” held in Washington, D.C., in March 2009, James O. Hill, PhD, director of the Center for Human Nutrition at the University of Colorado School of Medicine, asked, “Is telling Americans what to avoid really the best way to achieve the type of dietary changes we want?” Unsurprisingly, Hill said no. Most dietary counseling follows what he calls the Deprivation model. According to Hill, nutrition professionals should shift to the Enjoyment model, which, in his experience, consumers warmly embrace. Within his Enjoyment model, clients make small positive changes in diet that eventually result in big positive changes in health. The American Dietetic Association (ADA) published a position paper in 2007 that warned nutrition professionals against classifying foods as good or bad because it could foster unhealthful eating behavior. When recommendations center on the foods to avoid, the position paper stated, the good/bad dietary dichotomy is automatically created. Joan Salge Blake, MS, RD, LDN, a spokesperson for the ADA and clinical associate professor at Boston University, says, “I teach a course in dietary counseling to graduate students, and I tell them the best way to get your clients to comply is to get them to eat more, not less. Tell clients to add foods to their diets; don’t take anything away.” If you take everything they love away all at once, she asks, how can you expect them to come back? She also recommends focusing on the positives—one step at a time. Her observations are supported by the ADA’s “Nutrition and You: Trends 2008” report. Surveyed consumers cited not wanting to forgo the foods they love as a top reason why they don’t want to change their diet. However, Amy Mobley, PhD, RD, an assistant professor of food and nutrition at Purdue University, cautions dietitians to avoid becoming too one sided with recommendations to add foods, even if they’re healthful. “The message to increase certain foods, like fruits and vegetables, needs to be placed in the appropriate context for consumers so that they are not just adding calories but instead substituting these foods for other less nutrient-rich foods,” she explains. 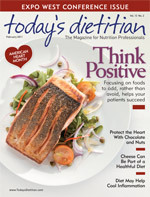 Focusing on a combination or portfolio of cholesterol-lowering foods may benefit CVD risk by both reducing serum lipids and lowering blood pressure.2 Four positive dietary approaches worth considering are the Portfolio diet; the nutrient-rich approach to diet planning; Dietary Approaches to Stop Hypertension, commonly known as the DASH diet; and the new Weight Watchers Points Plus program. While only the Portfolio diet is specifically designed for reducing CVD risk, all four are positive approaches to eating that, if followed, may lower cholesterol and reduce the risk of CVD. In 2003, David Jenkins, MD, PhD, DSc, and colleagues from the University of Toronto published the first of several papers on the Portfolio diet, showing that including specific heart-healthy foods such as soy, nuts, and high-fiber items in the diet could reduce cardiovascular risk factors. While the program recommended avoiding the traditional high-risk foods, such as those high in cholesterol and saturated fat, the focus was on adding heart-healthy foods to the diet. Several studies have found the DASH diet to be a positive approach to encouraging a healthful eating pattern rather than discouraging single foods or nutrients to lower blood pressure and reduce CVD risk. The DASH diet includes fruits, vegetables, low-fat dairy, nuts, and lean protein sources. The 2005 U.S. Dietary Guidelines clearly recommended that emphasis be placed on nutrient-rich foods, or those that provide substantial amounts of nutrients for relatively few calories. When more nutrient-dense foods are included in the diet, there is less room for foods that provide few nutrients and excess fat and calories. The 2010 Dietary Guidelines Advisory Committee Report appears to be following the same path by emphasizing the quality of the total diet rather than focusing on single nutrients or foods. The program, which was released in late 2010, encourages members to consume more fruits and vegetables, which now are classified as “free foods.” The overall diet is designed to steer people toward foods that are nutrient dense and places less emphasis on foods to avoid. While no study has carefully examined a comprehensive positive approach to diet advice for the prevention or treatment of CVD, the Portfolio diet research suggested that eating the right combination of foods can be as effective as statins in lowering cholesterol and reducing CVD risk. The goal is to achieve the maximum cholesterol lowering that diet can offer by combining all of the positive dietary recommendations shown to lower cholesterol and/or reduce risk. Almost every major health organization—from the American Heart Association (AHA) to the National Heart, Lung, and Blood Institute—offers positive mingled with negative dietary advice. Today’s Dietitian culled through advice from experts, health organizations, and researchers to develop a list of recommendations with a single criterion: The advice must be positive. • Add foods that contain plant sterols. The National Cholesterol Education Program recommends including 2 g/day of plant sterols in the diets of individuals with elevated serum LDL cholesterol. Just as with lipid-lowering medications, the sterol-fortified foods must be consumed daily to sustain LDL cholesterol reductions.3 Margarines fortified with plant sterols are widely available in addition to foods such as sterol-fortified milk, orange juice, pasta, bread, cheese, and frozen waffles. • Choose whole grain, high-fiber foods. Diets high in whole grain products and fiber are associated with a decreased risk of CVD.3 At least one half of grain intake should come from whole grains. Include whole grains such as whole wheat, oats/oatmeal, rye, barley, corn, and popcorn. • Regularly consume foods rich in viscous fiber. The National Cholesterol Education Program recommends consuming 10 to 25 g/day of soluble fiber. Foods such as eggplant, okra, oats, barley, and psyllium are rich in soluble fiber. • Snack on a single handful of nuts on most days of the week. Several studies have found that making nuts a regular part of the diet can reduce CVD risk factors and the risk of dying from CVD.4,5 Choose from almonds, pecans, walnuts, and pistachios. • Drink 3 cups of fat-free or low-fat milk or equivalent dairy products per day. Regularly consuming fat-free and low-fat dairy is an integral component of the DASH diet to lower blood pressure. • Choose olive oil over other fats. Research shows that a diet rich in olive oil can increase HDL cholesterol and lower C-reactive protein beyond the benefits obtained from a cholesterol-lowering diet.6 Other foods rich in monounsaturated fats include canola oil, avocados, hazelnuts, pecans, and pistachios. • Drink a moderate amount of alcohol (if consuming alcohol). The 2005 Dietary Guidelines stated that “alcohol may have beneficial effects when consumed in moderation.” That’s a maximum of one drink per day for women and two per day for men. (A drink is one 12-oz beer, 4 oz of wine, 1.5 oz of 80-proof spirits, or 1 oz of 100-proof spirits.) However, the AHA declines to make even moderate drinking a part of its heart-healthy diet recommendations. The organization states that given the risks associated with alcohol consumption, people should not start drinking if they do not already drink alcohol. • Eat more fruits and vegetables. Diets rich in vegetables and fruits have been shown to lower blood pressure and improve other CVD risk factors, resulting in a decreased risk of CVD and stroke.3 The AHA offers no specific recommendation for amounts and simply recommends consuming a diet rich in fruits and vegetables. While any increase in the intake of fruits and vegetables is a step in the right direction, the USDA Food Guide Pyramid recommends 3.5 to 5 cups per day. • Choose lean meats. Research has shown that lean beef can be an important part of a well-balanced diet designed to reduce the risk of CVD.7 The AHA includes lean beef—there are 29 lean cuts, including round, sirloin, chuck, and loin—and lean or extra-lean ground beef in its heart-healthy diet recommendations. • Include soy protein as a regular part of the diet. The Portfolio diet includes 21.4 g of soy protein per 1,000 kcal. A labeling health claim approved by the FDA says that 25 g/day may help lower cholesterol and reduce the risk of heart disease. While not everyone agrees on the cardiovascular benefits of soy protein—the AHA stated in Circulation in 2006 that “the direct cardiovascular health benefit of soy protein or isoflavone supplements is minimal at best”—soy foods are low in saturated fat, are an excellent source of high-quality protein, and most are a good source of fiber. Foods rich in soy protein include soy milk, soy yogurt, tofu, soy burgers, soy nuts, and soy pasta. While the avoidance approach to dietary advice for reducing the risk of CVD has long been the gold standard, the tide is shifting. Now the emphasis is on foods to add to the diet rather than those to eliminate or avoid. The goal is to emphasize these risk-reducing foods, one at time, until they eventually crowd out less-healthful foods to be avoided. However, individuals must take care to ensure that they’re not simply adding foods (and calories) to the diet but that they are ultimately making healthful substitutions. 1. Mobley AR, Kraemer D, Nicholls J. Putting the nutrient-rich foods index into practice. J Am Coll Nutr. 2009;28(4):427S-435S. 2. Jenkins DJ, Kendall CW, Nguyen TH, et al. Effect of plant sterols in combination with other cholesterol-lowering foods. Metabolism. 2008;57:130-139. 3. American Heart Association Nutrition Committee, Lichtenstein AH, Appel LJ, et al. Diet and lifestyle recommendations revision 2006: A scientific statement from the American Heart Association Nutrition Committee. Circulation. 2006;114(1):82-96. 4. Sabaté J, Ang Y. Nuts and health outcomes: New epidemiologic evidence. Am J Clin Nutr. 2009;89(5):1643S-1648S. 5. Sabaté J, Oda K, Ros E. Nut consumption and blood lipid levels: A pooled analysis of 25 intervention trials. Arch Intern Med. 2010;170(9):821-827. 6. Jenkins DJ, Chiavaroli L, Wong JM, et al. Adding monounsaturated fatty acids to a dietary portfolio of cholesterol-lowering foods in hypercholesterolemia. CMAJ. 2010;182(18):1961-1967. 7. Beauchesne-Rondeau E, Gascon A, Bergeron J, Jacques H. Plasma lipids and lipoproteins in hypercholesterolemic men fed a lipid-lowering diet containing lean beef, lean fish or poultry. Am J Clin Nutr. 2003;77(3):587-593. 8. Mitchell DC, Lawrence FR, Hartman TJ, Curran JM. Consumption of dry beans, peas, and lentils could improve diet quality in the US population. J Am Diet Assoc. 2009;109(5):909-913.